Looking for a juice for the whole family that is 100% juice blends with no added sugar? Ocean Spray offers a wide variety of fruit blends, also some that are diet or low calorie juices. These juices are sweetened with Splenda. Sign up for Ocean Spray's newsletter and be the first to receive new recipes, coupons and special offers. 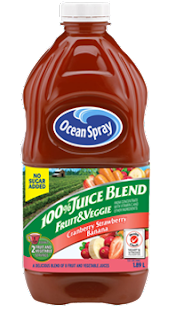 Looking for a coupon - get $1.00 off any Ocean Spray product with this printable coupon, offer is only valid in Canada.